After looking at these sections and stalling and putting them off, I finally decided that I would just do IT! For the past few days, I’ve been working on a sweater for me and since the back is done, I finally got moving on this. I’ve been dreading cutting the larger pieces (trimming the flannel and backing at the edges), so I’ve not done it! Well now I have (least these 2 sections I have), and I’m just going to get moving on this .. 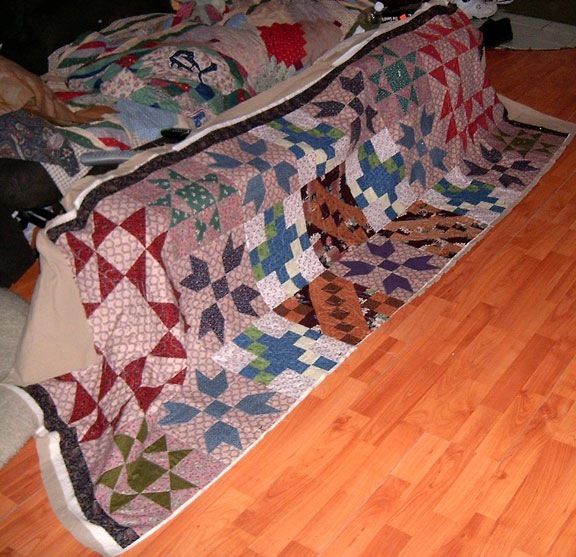 I guess I’m not in a finishing mood right now – or rather not in the mood to do the heavy work of quilting .. this is what I call the heavy work .. manhandling the quilt instead of the smaller blocks. And of course I’ve not done the same thing in each section as I’m rather making this up as I go along .. I will have to hand sew one of the seams along the back, but that can be done when I do the binding. So here’s the two sections that I have pieced so far .. I’ve got the final third, then the final battle of getting all 3 long sections into 1 quilt .. and no I’m not looking forward to this at all! But I’ve vowed no more new quilt projects until, I’ve a few finishes under my belt. As you can see I’m not going to have the room to show you the finished quilt, I’m not even sure I’ll be able to lay out the 3 sections before they are finally pieced together!! I do have a plan for showing the finished quilt. At my dad’s house, there’s a sun roof off my old bedroom. I was thinking of hanging that on pant hangers and then hanging it off the gutters, then taking a pic from there. Of course that will have to wait until the weather is warmer. I could do that here, but I’ll have post railings and deck railings from the front and back porch / deck interfering with the lay of the quilt and it won’t look all that great. So that is the plan at this point. I have been in knit mode lately – made 6 dishcloths and am working a cabled hoodie for me – I’ve altered the pattern so it’s a full frontal zipper, but have not started the front yet. Since my old blog was finally unlocked, I may just use that one for my knitting project progress and share the postings of finished projects here .. still thinking about it. Gracie, I love the way you have taken several different sizes of blocks and joined them. Cool! It’s looking so nice, all the work put in is definately paying off! Wow it is really coming along nicely. Great job. It’s amazing how you can draw/draft up a pattern and then actually make something that looks just like the drawing!! Very cool. These blocks individually aren’t really my cuppa, but you’ve really turned them into something special here. As for ‘large places’ – what about the school gym? Do schools still have stages? I’d guess there’s somewhere to hang the projector screen (gawd, I must be 114 years old!!!) Do you have access to a church social hall or basement? Where do all the old farmers and veterans go and hang out and have dances and potluck dinners? 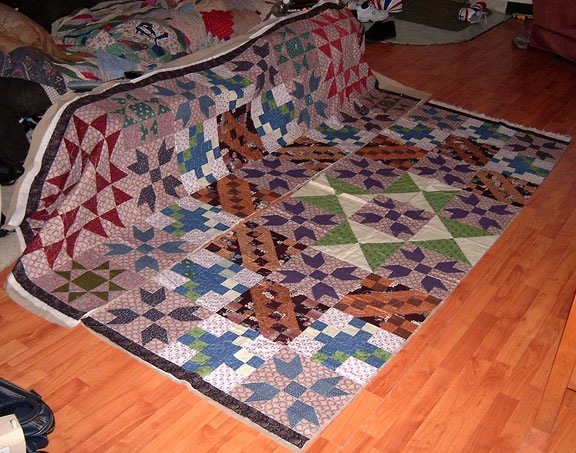 It looks good but I’m like you — sometimes I just can’t handle the bigger projects — that’s when I work on piecing blocks!